Our research aims at elucidating the molecular-level mechanisms behind control of 3D genome organisation at the nanoscale level. 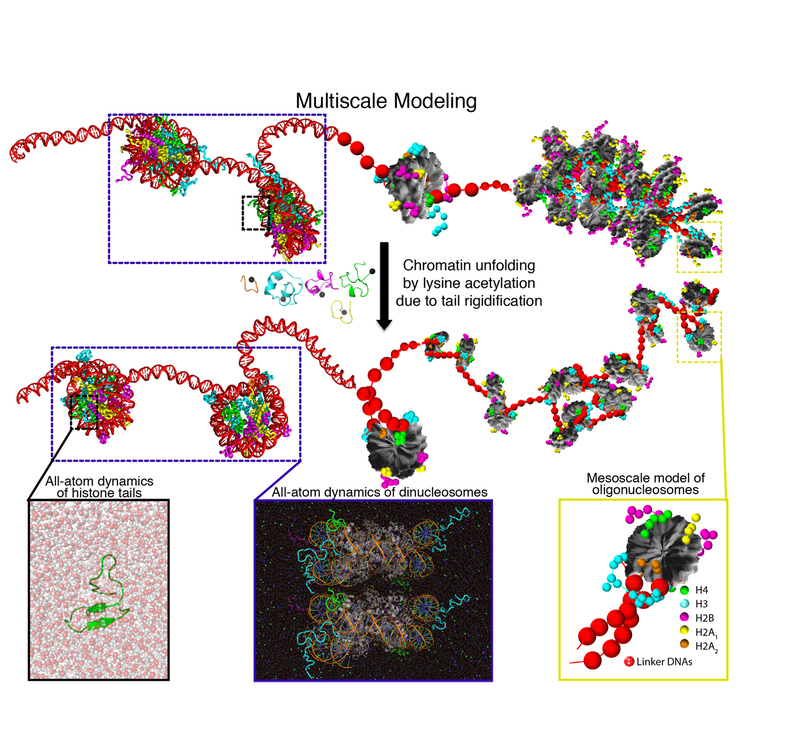 To do this, we develop and apply novel multiscale computational models for nanoscale chromatin that are anchored in all-atom molecular dynamics simulations, coarse-graining techniques, theory, and experiments from collaborators. 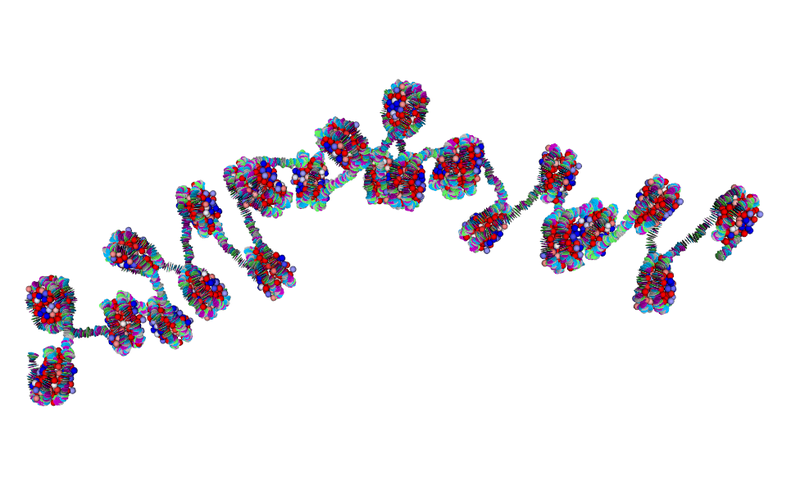 Steve's work integrates atomistic information of chromatin domains with two levels of coarse-grained Monte Carlo (MC) simulations and experimental data for validation. The high-resolution coarse-grained model part includes accurate molecular representations of nucleosomes with histone tails, epigenetic marks, architectural proteins bound to nucleosomes, protein oligomers, DNA unwrapping, and nucleosome sliding. The low-resolution coarse-grained model maps these factors implicitly to investigate nucleosome organization at Mb scales. Deciphering how epigenetic marks interact to govern the physiological form of the genome (chromatin) is key for unraveling some of the most basic cellular functions, including transcription activation and gene silencing. The structure of chromatin – and hence the level of DNA accessibility – can be altered by a wide-range of epigenetic modifications that lay “on top” of the genome. These comprise histone modifications (including but not limited to methylation, phosphorylation, and acetylation), introduction of histone variants, and presence of modified DNA bases. This epigenetic information determines the function of the genome in different cell types and developmental stages. Furthermore, in many diseases, such as cancer, accumulation of aberrant epigenetic marks induces critical gene deregulation, and together with genetic alterations, might trigger abnormal cell behaviour. Despite their importance, the molecular mechanisms behind the epigenetic control of chromatin structure are not clear. We investigate these mechanisms by developing and applying tailored multiscale approaches for chromatin at the nanoscale (~100 nucleosomes) anchored in all-atom simulations, coarse-graining techniques, theory, and experiments from collaborators. Our work (JACS, 2015) combines all-atom molecular dynamics (MD) simulations of histone tails (aggregated time 0.6 milliseconds) and dinucleosomes in explicit solvent (800,000 atoms; 4 microseconds), experimental NMR data, and coarse-grained chromatin modelling to shed light on the molecular mechanism of chromatin structure control (e.g. how H4 LYS 16 induces chromatin decompaction). Akshay's work, in collaboration with the group of Prof. Modesto Orozco, focuses on investigating unknown molecular mechanisms involving the H1 linker histone protein. 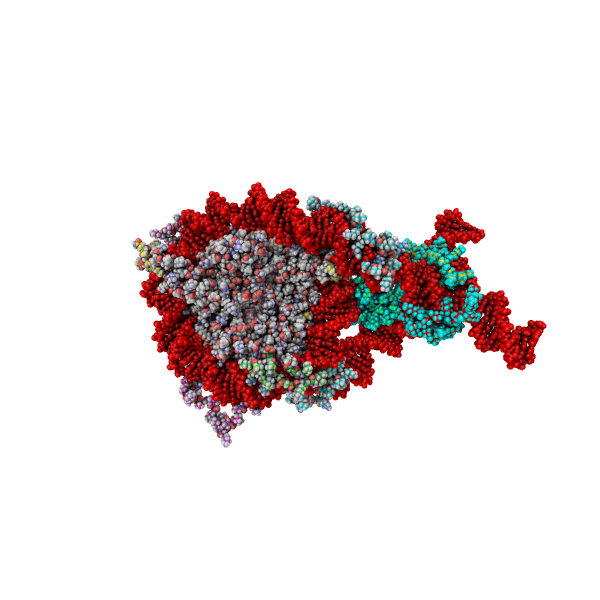 For his work, he performs atomistic molecular dynamics (MD) simulations of proteins and DNA/protein complexes with various enhanced sampling methods, including Bias-Exchange Metdaynamics, Replica Exchange MD, Replica Exchange with Solute Tempering (REST2) and Umbrella Sampling. He also works with the Martini coarse-grained model. Adiran's work is in collaboration with the groups of Prof. Ernest Laue (Biochemistry, Cambridge) and Prof. Daan Frenkel (Chemistry, Cambridge). Adiran is developing a new coarse-grained model to investigate the phase behaviour of chromatin in conditions that lead to liquid demixing. The three-dimensional organisation of DNA is one of the great marvels of physical biology. Someone who grew up in the time when telephones still had cords will remember that even a short (one-metre) telephone cord would get hopelessly entangled. Now compare this with the two-metre-long chromosomal DNA in each of our cells, which would be thousands of kilometres long if we magnify its two-nm diameter to the thickness of a telephone cord. By winding around a special class of proteins, DNA manages to avoid entanglement, compresses enormously to fit inside tiny (6 μm) nuclei and, moreover, maintains exquisite control over the accessibility of the relevant data. 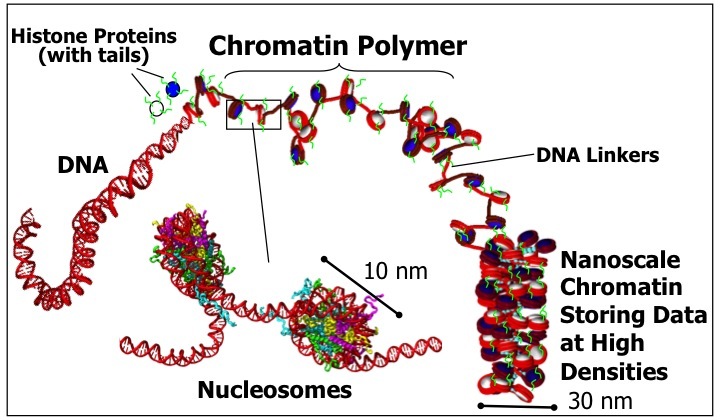 Clearly, there is a lot of materials science that we have to learn from this remarkable complex of DNA and histone proteins, known as chromatin, in order to achieve similar data-storage densities and control. Our research aims at elucidating the design principles of data storage in chromatin and translate these principles into design rules for novel sustainable data storage devices. Chromatin is the actual substrate for all DNA-directed processes and thus changes in chromatin structure are intimately linked to gene regulation. 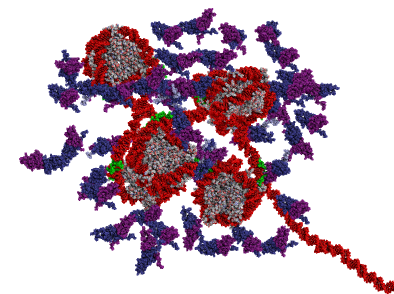 We have demonstrated that the highly heterogeneous characteristics of in vivo chromatin (e.g. non-uniform linker DNA lengths, varying chemical compositions, diverse DNA flexibilities) are consistent with an irregular polymorphic structure (PNAS, 2014). This result reconciles apparent contradictory evidence of chromatin structure, implies that chromatin is much more disordered and fluid than originally proposed, and explains how chromatin achieves various different roles in vivo according to the transcriptional state, cell-cycle stage, or in response to environmental signals.